In order to reach their goal of winning Super Bowl LI (maybe we should call it Super Bowl Lochte? ), the Patriots seem intent on making sure that they have a 1 and a 1A at every key position, lest they get into a situation like they had last year when injuries at key positions led to their downfall. Last year, injuries at tackle, linebacker, and slot receiver/punt returner turned the team from a unstoppable force into a fatally-flawed squad as they limped down the stretch before succumbing to the hated Broncos. Watching Thursday night's preseason matchup vs. The Bears, the coaching staff clearly wants to build the versatility and depth of their roster to make sure they have no gaping holes when the injury bug bites (well, it already has). Ideally, when a player goes down at one position, another player can step in and assume that role with little or no drop off in productivity. In watching the game Thursday night, the team has achieved that ends at several positions. 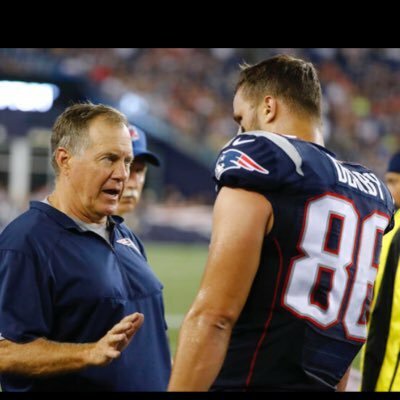 TIGHT END: Over the past 6 years, the health of one single player on offense not named Tom Brady determined whether the team could win a Super Bowl or not. Of course, I'm talking about Rob Gronkowski. Gronk is a unique specimen in the NFL and is rarely contained by opposing defenses, but when he has gone down with injuries the last few years, the third tight end on the team, whether it be Michael Hoomanawanui or Michael Williams, couldn't elevate his game from being a blocking-tight end to a third down playmaker. Last season, the situation was complicated by the utterly-disappointing Scott Chandler since he didn't emerge either as a reliable receiver or a run blocker. Chandler's failure, along with Williams' ineffectiveness as a receiver, forced the team to abandon all of its creative-passing plays it ran out of big formations with 3 tight ends late in the season, thereby making their offense more predictable. The emergence of A.J. Derby as both an quality receiver and an improved-run blocker could provide the Patriots a nice insurance policy. In the regular season, it wouldn't come as a surprise if were to see a package with with Gronk, Derby, and Martellus Bennett on the field together. Imagine the panic in the defense if all three were split out wide as triplets? The opposing secondary would resemble a bunch of castaways on a desert island waving frantically for the search and rescue helicopter on the horizon. Against Chicago, we saw Derby playing both the traditional "Y" role, as well as in the "F" role. He made plays in both positions during his time on the field. If Gronk or Bennett were to go down, the team could still run its entire offense with Derby in the mix. Derby still needs to show he can block in the running game with consistency. The good news is that veteran Clay Harbor is still in the mix and the latter has shown the ability over his career to block and catch effectively. CORNERBACK: As I mentioned last week, I CAN'T WAIT to see Malcolm Butler, Logan Ryan, and Cyrus Jones on the field together. The Patriots struggled last season matching up against teams that had three quality wideouts. The drop off between Ryan and the third-corner-du-juor last season whether it was Justin Coleman, Leonard Johnson, or Rashaan Melvin was pretty drastic. At times, Coleman was decent, but he was inconsistent, such as when Denver exposed him in the AFC Championship. Jones gives the Patriots a guy that can play inside or outside. Since Ryan also has experience covering the slot, it would come as no surprise if Belichick uses all three and disguises coverages. Rookie Cre'von LeBlanc again showed coverage skills and tackling ability but he was caught napping on the Hail Mary TD at the end of regulation. Let's hope that the coaching staff helps him eliminate this type of mental mistake in the future. Adding to their numbers, sophomore Darryl Roberts had a much better effort against Chicago. Last year, the team was very thin at corner even in camp, so there is cause for optimism because of this group's depth and ability for several of their corners to play inside or outside depending on player health and opposing personnel. WIDE RECEIVER: The injuries to Julian Edelman and Danny Amendola effectively created holes for TWO key positions last year - slot receiver and punt returner. The latter ended up being a more dramatic loss as it cost them the game at Denver and nearly turned the tide in Houston as both Chris Harper and Keshawn Martin fumbled punts in the two games. When Harper replaced the injured Edelman and Amendola at the slot, the production at the position declined significantly. Brady no longer had his safety outlet and he was often forced to hold the ball too long or merely throw it away. This preseason we see that newcomer Chris Hogan has the juke moves and quick cuts to play the slot. He also has the size and speed to play the X. At various points last year, Brandon LaFell was so unproductive that the team chose to Edelman split wide and put Amendola in the slot. The team is better when BOTH these players play between the hash marks. When Malcolm Mitchell returns, he can also play outside. Martin, when healthy, showed he can be a deep threat as well. This year, the team has a plethora of able bodies to play various roles so that they can run their entire offense when one or two of their receivers miss action due to injury. RETURNER: Jones again looked very comfortable returning punts and perhaps he'll be the primary returner right out of camp. The last few years since no one else stepped up both Edelman and Amendola shared this duty, thereby exposing themselves to further injury. Again, not assigning punt return duties to the primary slot receiver prevents the Patriots from filling two roles if that man were to get hurt. Instead, perhaps either Amendola or Edelman could instead serve as a backup or situational returner so they can take a few less punishing hits during the course of the game. For kickoffs, the new rules even further diminish the need to develop a specialist at the position. RUNNING BACK: Last year, no one questioned the loss of Dion Lewis deprived them of one of the best offensive weapons last season, but neither can one deny that James White stepped up and continued to get better with each week. White again showed flashiness in the screen game with a Lewis-like run after catch on a 14 yard screen that brought the ball inside the 1-yard line. With Sunday's bad news that Lewis indeed had a second knee surgery it now seems likely that White will assume this role from the start of the season. Also, it was nice to see LeGerrette Blount show both power and elusiveness on several of his runs. His performance firmly established him as the power back on the roster. Bill Belichick traditionally stores a power back on the practice squad. Could they risk putting Tyler Gaffney on the practice squad, thereby exposing him to claim by another team? Joey Iosefa doesn't seem like a good option at all, since he's not making any plays at all in the preseason. OFFENSIVE LINE: With the news Sunday that Sebastian Vollmer will be placed on IR, there is now a gaping hole at right tackle. Due to the up and down play in pass protection from Marcus Cannon and Cameron Fleming, the Vollmer injury is a concern. Cannon played well last Thursday and needs to be at least solid in protecting the right flank. Last year, Bryan Stork made one start at right tackle and was a solid substitute. Perhaps we will see him do the same again in one of the next two games in order to showcase his versatility fill a void. The team is quite deep at guard and center with at least two deep at each position. Look for the team to keep guard Tre Jackson on the PUP, which gives them a nice insurance policy after week 6 in case injuries start to mount. With the news Sunday that Shaq Mason has a broken hand, the situation is a bit muddled, but there is enough depth in this group to overcome the Mason injury. The group blocked effectively against Chicago opening some nice holes for Blount. They will need to do this consistently in order to prevent opposing DE's from teeing off on their vulnerable right side. DEFENSIVE LINE: Preseason injuries to Rob Ninkovich, Jabaal Sheard, and Shea McClellin provided an opportunity for Trey Flowers to prove he can compete effectively in the NFL. After a standout performance in the first game Flowers again showed a solid pass rush. Against The Bears, Flowers demonstrated he could both set the edge and defend the run. Defensive ends that can't play the run are exposed quickly in this league so it's nice to see that Flowers is developing into a four-down player. The team is clearly four deep at end, which also allows the coaching staff the ability to consider moving Ninkovich or McClellin to linebacker, if needed. If that were to happen, Geneo Grissom showed that he can be a part of the rotation as well. At tackle, the team has plenty of beef inside. A major development occurred on Thursday, when Anthony Johnson made his svelte-280-lb. presence felt with half a sack, a few pressures, and a batted ball. He won his battles against Chicago's interior lineman and now provides the team with depth, especially on third down. In fact, they are so deep at DT, that an NFL-quality player will likely get cut. Despite the team plugging some holes and developing backup plans at key positions so far this preseason, there still are areas of concern, mainly on the defensive side of the ball. In particular, if Pro Bowl players Jamie Collins, Devin McCourty, and Dont'a Hightower go down, the team does not yet have a good alternative. Collins and Hightower both can wear the green dot but once one goes down, teams can still expose the replacement. Against Chicago, rookie Elandon Roberts emerged in the second half and made plays all over the field. He was a tackling machine in college and in both preseason games he showed the heart and grit required to take on opposing behemoth offensive linemen. He also had a few nice rushes, including a crushing QB hit on ex-Patriots Brian Hoyer near the goal line. The coaching staff showed confidence in the rookie as well since he was the signal caller for most of the second half. The Patriots really lacked a run-stuffing LB off the bench last season, so his development over the next two weeks bears watching. Last season many fans and media believed that Butler was the one player the team could ill afford to lose on defense for an extended period. After watching two preseason games, the key guy this year is McCourty. If D-Mac were to get hurt, they would likely move Duane Harmon to FS and increase the role for Jordan Richards. The latter struggled mightily against the pass against Chicago and he needs to improve in this area if the coaching staff wants to increase his playing time on the first three downs. At strong safety, it is still unclear who is the primary backup to Patrick Chung. Given the emergence of the TE role in virtually all NFL offenses, the SS absolutely needs to play in the box on 3rd down and cover TE's or FB's. Two weeks remain on the field for some bubble players to step up and claim a role as a virtual Swiss Army knife to create roster flexibility . . . and most importantly, redundancy. Stay tuned.